FBTBForums.net :: View topic - Thoughts on the latest SW parts and figures. Posted: Tue Dec 23, 2008 1:38 am Post subject: Thoughts on the latest SW parts and figures. I picked up the new ATT at a Target today and I am actually happy with the new Yoda figure. I thought for sure I'd hate it (I dislike the animated faces on the new figs, especially Mace Windu) but I was surprised with the detail on the head sculpt. It is the new rubbery plastic. Yoda has painted gray hair on the back! The eyes don't look as enormous as I thought they would. I daresay I am starting to prefer it to the old Yoda sculpt. The new silver sabers add a nice variation. They are silver as if they were painted, not chromed. The new Super Battle Droid arm with a machine-gun tip is also a nice addition. Yeah, the anime face doesn't look bad on Yoda. From the pics I've seen I love the new supers. 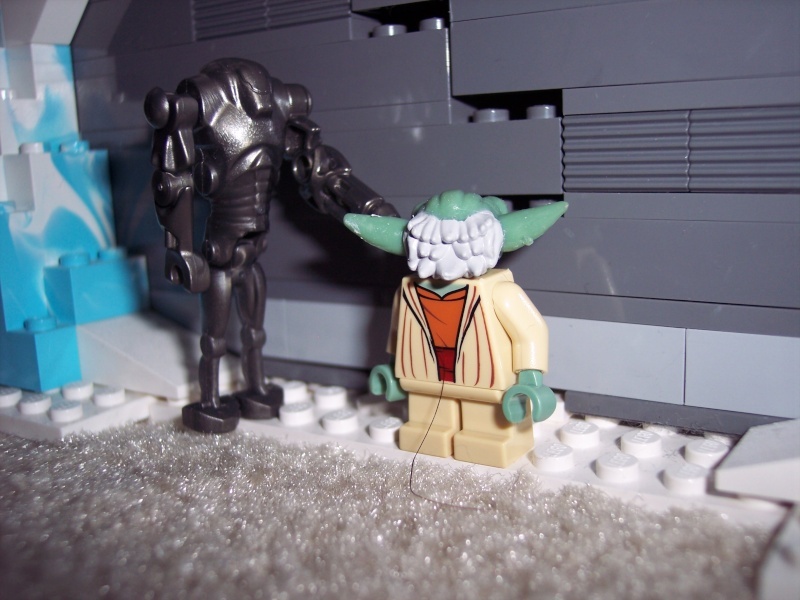 And you say Yoda has painted grey hair? That is just awesome! And you say Yoda has painted grey hair? That is just awesome! Honestly this is one of the few Clone Wars sets I plan on buying. I actually like the look of Yoda, along with the Super Battledroid's new arm. And the Tank itself is nice looking too. Specifically, if you're going to embed an image, keep it under 640 x 480. Thanks. i for one am enjoying the "anime" style variety.. Does anyone happen to have a list--not pictures or a list or rumored sets--but just a list of 2009 SW Lego sets that have been released to the public as of today? Thanks. I'm going to wait until I own the new AAT to pass judgement of the new Yoda fig. When I first spotted the box art, the fig didn't sit right with me from the start. It appeared light green, with a Duplo design. I saw some actualy pictures of it off Targets website, and it didn't seem so bad. The torso is a little upsetting. Not really much to it. Then again, there wasn't much to the original Yoda as well. There's really no list, unfortunately. It's all about luck, you might say(contrary to Obi-wan, though). TRU is, however, the best place to find them. Or search on Brickshelf "star wars 2009"
Yeah, TRU is where I first found out they were actually already being sold, but when I went to the entire Lego Star Wars section on the site, it missed some set is advertised and already had out, such as the Clone bp. I found all but the battle packs at one of two local Targets. I don't like the new Super Battle Droid arms. Any particular reason why not? I haven't seen them yet and I was just wondering. I haven't seen them yet and I was just wondering. Zoom in to get a better veiw on the arm itself. I think they're good, they resemble the wrist blaster and rocket launcher relatively well. Now there are actual rubberized lego slopes. The sloped tails of the little speeder in the Assasin Droids battle pack are actually rubber! However the Assassin Droids Battle Pack seems to be the only set that contains the part? (according to BrickLink). Plate, Modified 1 x 2 with Angular Extension and Flexible Light Bluish Gray Tip - now there's a fancy name! I see now it is in some 2008 Exoforce sets. Ugh rubber Lego - blick. Darn little kids always poking their eyes out ruin these sets for everyone. On that note, my S&H flyer shows that the Pirate cannons can shoot again. What's up with that after they were banned years ago? Oh no. Not the sequel to A Christmas Story! Mothers will start using the excuse not to buy lego! "You'll poke your eye out!" Heaven forbid! I've never been a fan of rubber parts and lego going together. Except for teh Kit Fisto head, that turned out relatively well. Everything else in my opinion should really be, unless it has to be rubber, should be plastic. The only 2009 Star Wars sets I own are two Clone Trooper Walker battle packs. As much as I wince to look at those faces, the wonderful armor design makes me overlook this stylistic change in facial appearance. The pieces included were really nice, and the gunner figures are really cool to look at. My only beef was that, for some odd production reason, all the left legs of my clones (both packs) are made of a slightly less-solidly colored white plastic. In other words, they are translucent in certain lights. Otherwise, they look great. I hope I can say the same about the rest of this year's lineup!